There are a lot of great scenes waiting for cameras in Hawaii as I learned when I visited the Hawaiian island of Oahu for the first time. 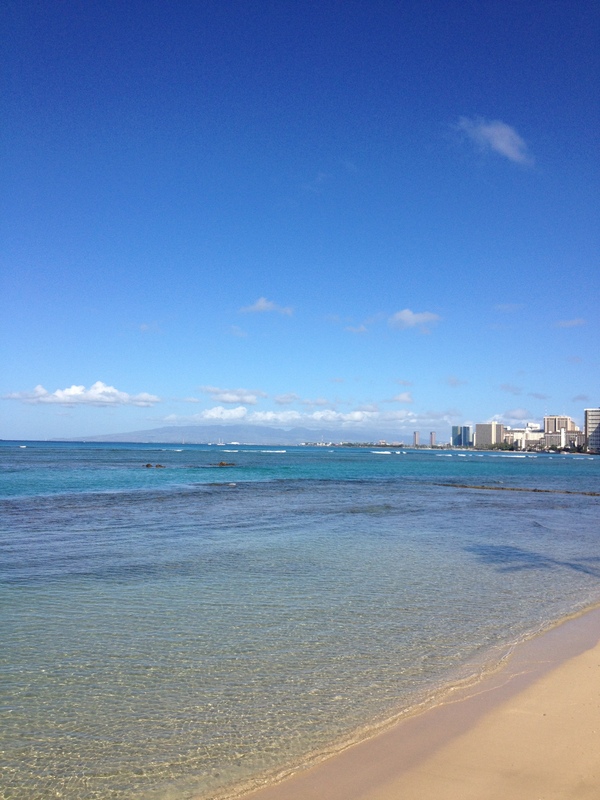 I made the trip for work, so I spent most of my time at the convention center, or near my hotel on Waikiki Beach. My last day there, I walked a few miles from my hotel to another set of meetings near Diamond Head, and took lots of photos. 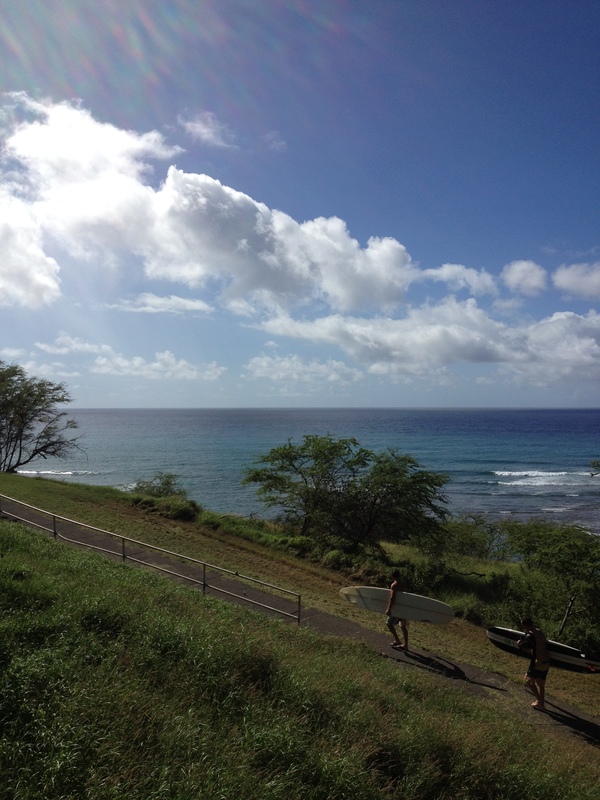 That distant hill and point is Diamond Head. I took this photo from the harbor near my hotel on the afternoon of my arrival. 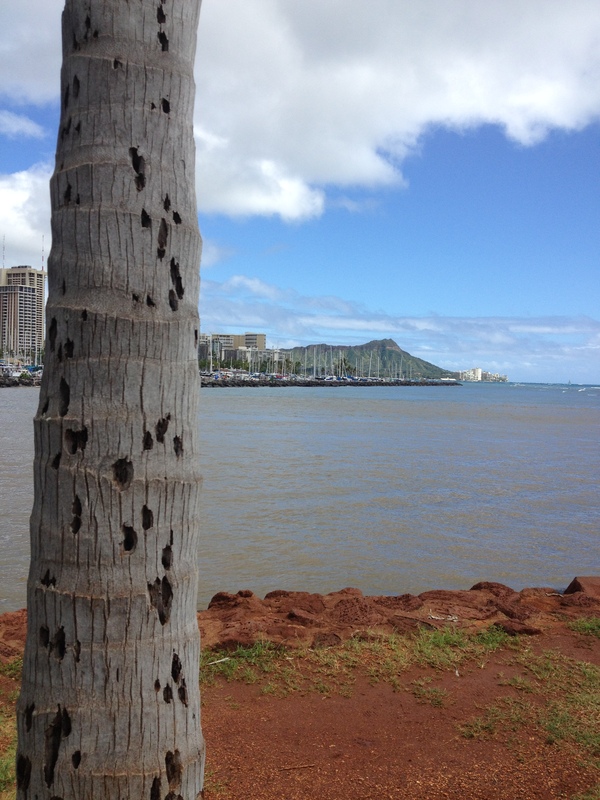 I didn’t see any bugs in Hawaii but saw much evidence of their existence, such as in the trunk of this tree. 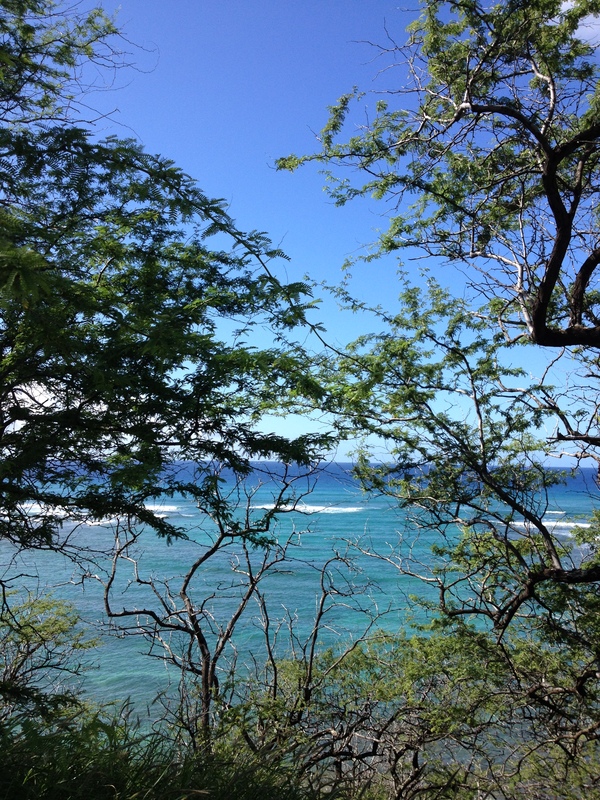 The walk to Diamond Head was the most ambitious excursion of my trip and most of it took me through spectacular scenery. in the distance is my goal, lit by dawn sunlight. 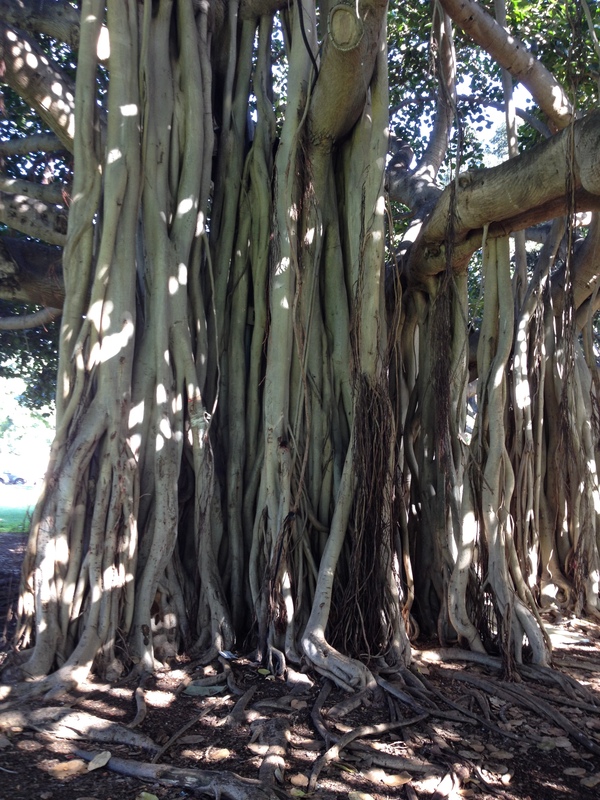 The banyan tree is a common sight on Oahu. Older trees have roots that grow up and add themselves to the trunk, creating a broad, ropey base, like this tree en route to Diamond Head. Whatever you do, don’t feed those …. um …. those…. Altered signs seem to be a trend here. And then there are signs that promise other alterations. Why wait until dinner? I call this one cutting to the chase. 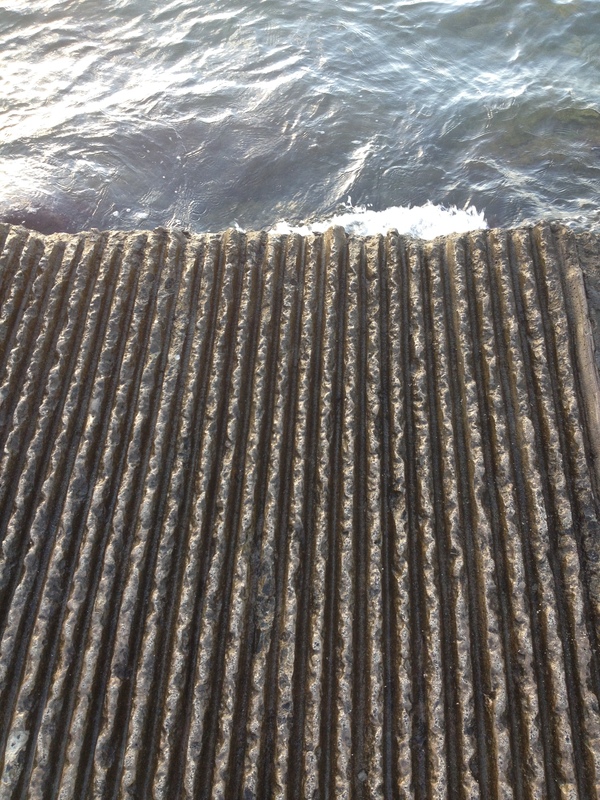 I loved the rough surface of this jetty, which exists to protect tourists from slipping into the sea. 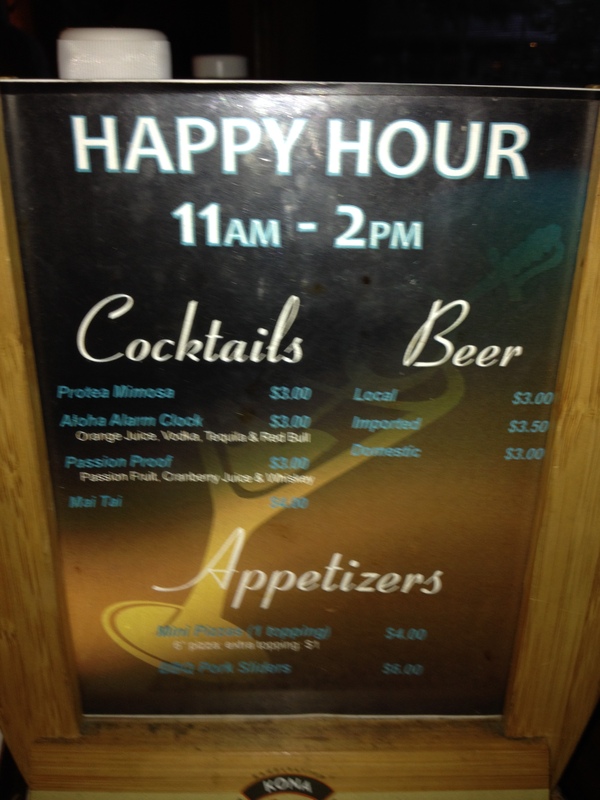 It may be too close to the lunchtime happy hour to succeed at all times, however. Now I’m on the Diamond Head side of my earlier photos, looking west and back toward the Waikiki Beach hotels. 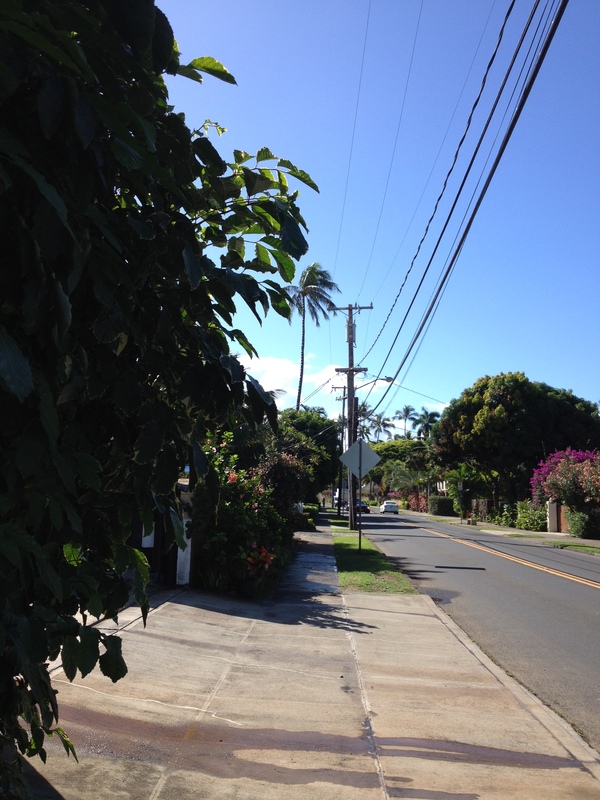 The road took me uphill through neighborhoods that reminded me of Santa Barbara, California. Only 9a but it was getting warm. 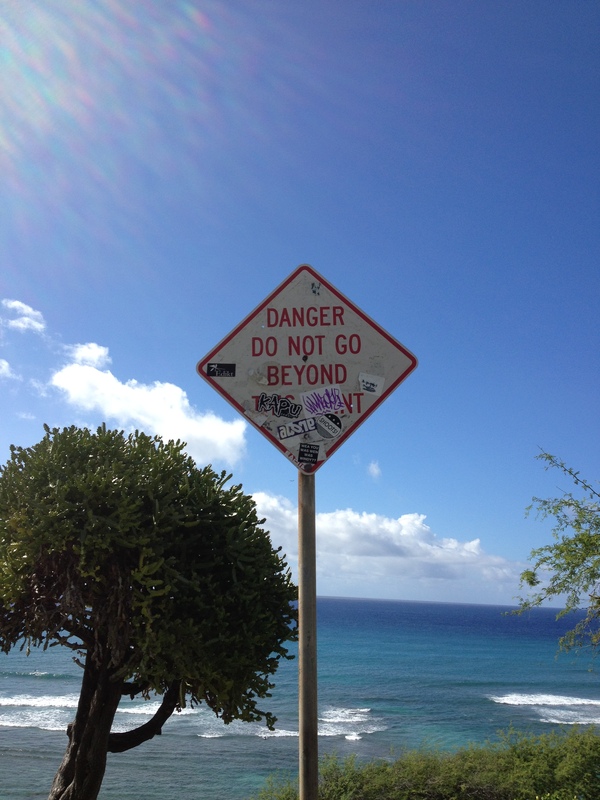 I went past cliffside parks with trails down to the ocean, some of which were not safe to hike. Or anyway I think that’s what the sign was trying to tell me. 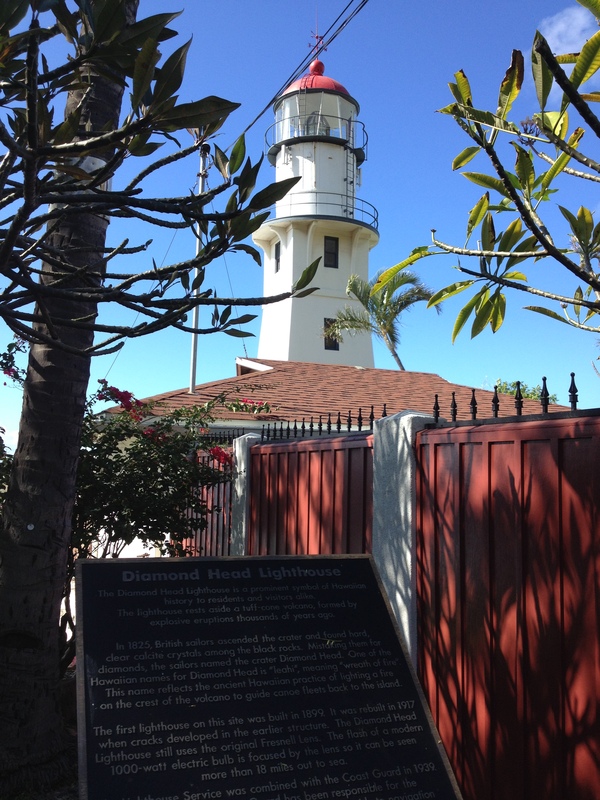 There was an old lighthouse, now occupied by an island bigwig. Surfers in Hawaii have so many choices of places with great waves! 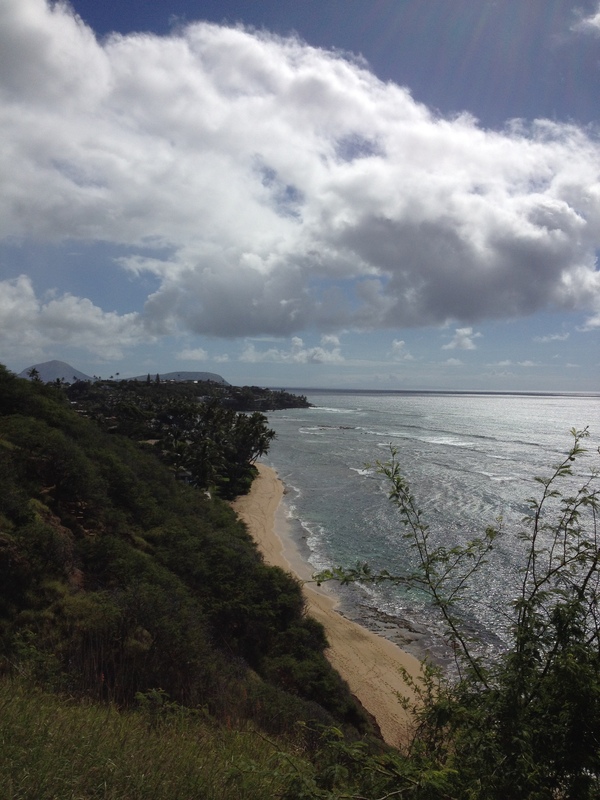 During my week on Oahu, the weather fluctuated continuously although the temperature held to the high 70s, low 80s. Sunny then cloudy then drizzle then wind. Blasts of rain punctuated with balmy breeze. Humid then less humid then more humid again. Clouds from the north were always piled up against the mountains that stretch along the center of the island. I took this photo of the clouds and mountains from the glass elevator at my hotel. 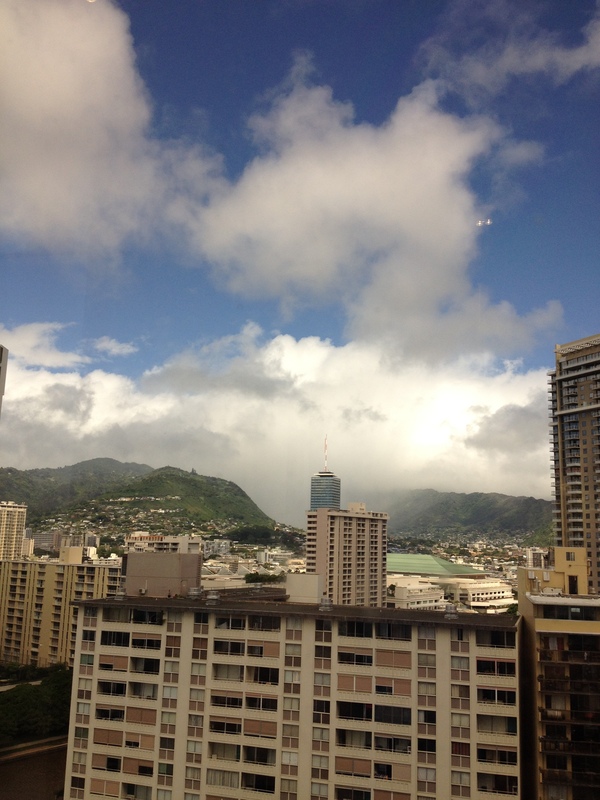 Here is a cloudy moment near Diamond Head. It came amidst the sunny moments like this one. This is the second of three posts about my trip to Hawaii. 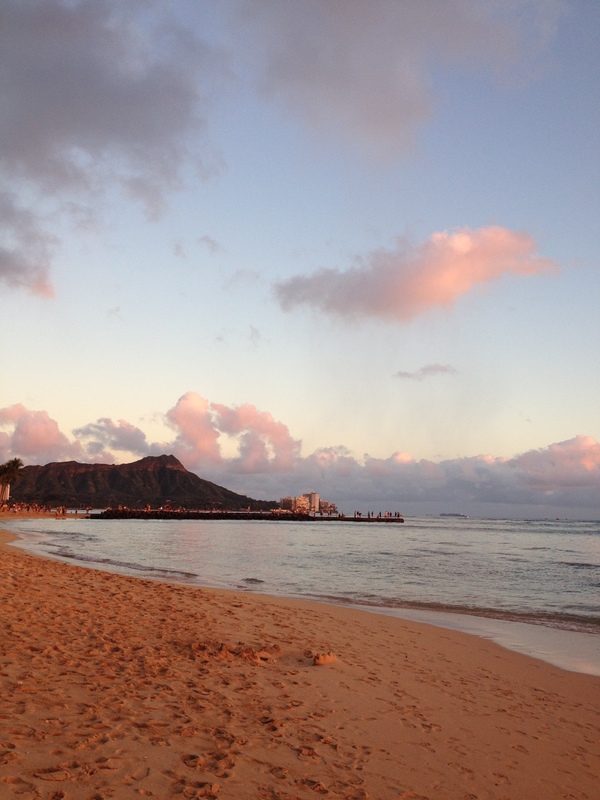 I also blogged about the sights near Waikiki and glimpses of non-tourist Oahu. I was planning to tell you my favorite of these pictures in this comment, but I’m having a lot of trouble deciding. 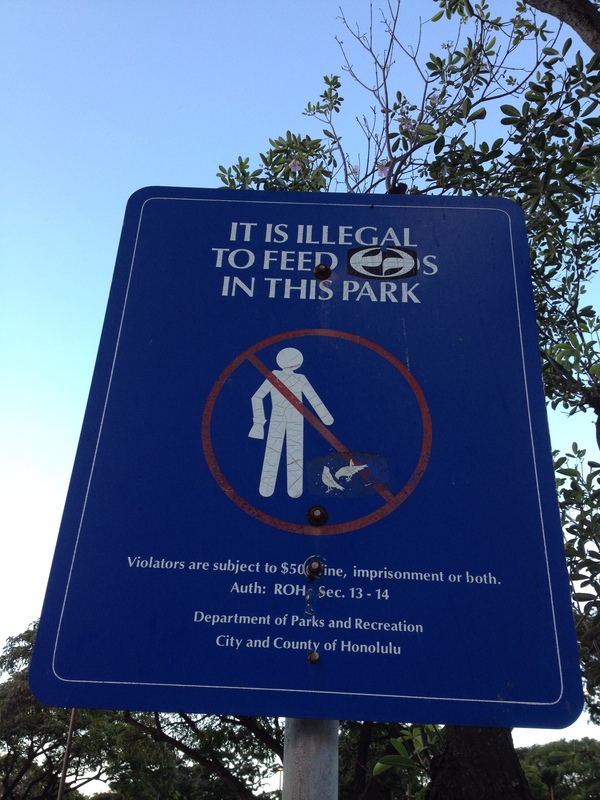 Probably Diamond Head at dawn, or the “no feeding the sharkchickens in this park” sign. p.s. I’m glad to see new posts, here! Sharkchickens! Of course! I should have realized that’s what that indicated!